Available in multiple sizes and colors so you can add your own personal touch. 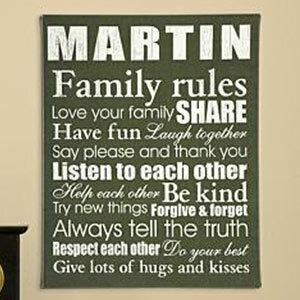 This Family Rules Canvas offered exclusively from Personal Creations is just what you need to inspire all of your family members to “laugh together”, “help each other”, and “give lots of hugs and kisses” this holiday season. This uniquely designed piece can be personalized with your family surname or the title of your choice including up to 12 characters for a completely one of a kind display. Choose from various colors and sizes to match your home’s decor! Choose from three sizes: 11 in. x 14 in.,16 in. x 20 in. or 18 in. x 24 in. 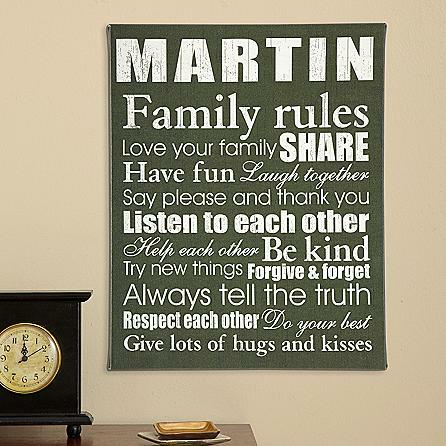 This canvas artfully displays the simple “rules” for a contented and happy family life.